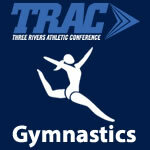 Gymnastics – TRAC Sports – The Official website of the Three Rivers Athletic Conference. The 2014 TRAC All-Conference teams for girls gymnastics have been announced. Senior Jody DeMeo of Clay was named the TRAC Gymnast of the Year. St. Ursula Academy head coach Megan Wojtkowiak was selected as the recipient of the Coach of the Year award. A student-athlete earns all-conference status based on their performance. In order for a gymnast to be named to the all-conference first team she must have placed first, second, or third in an event during the conference gymnastics championships. Selection to the second team all-conference requires a fourth, fifth, or sixth place finish. A seventh or eighth place finish earns the gymnast honorable mention all-conference status. Clay senior Jody DeMeo displays her TRAC Gymnast of the Year award. Clay senior Jody DeMeo was crowned the Three Rivers Athletic Conference Gymnast of the Year at the TRAC gymnastics championships. However, according to The Press sports writer Mark Griffin’s feature article on DeMeo, she would have rather had her Clay gymnastics team win the team title. DeMeo, however, isn’t complaining after winning the individual all-around TRAC title. She earned that title by winning the floor exercise and tying for first place on the beam. She tied for third on bars and tied for sixth on vault, earning her TRAC Gymnast of the Year honors. She is the first Clay gymnast to win that award since Kylee Ault led the Eagles to the City League title in 2011. St. Francis de Sales hosted the annual Three Rivers Athletic Conference winter sports pre-season coaches meeting on October 24, 2013. Athletic Directors from TRAC member schools and the coaches for all boys and girls winter varsity sports attended the event. Following a brief general meeting with all TRAC representatives, the coaches split into individual groups according to their particular sport to discuss such topics as their upcoming season, new rules changes implemented by the Ohio High School Athletic Association, and TRAC tournament formats. Coaches for each TRAC varsity sport gave a brief presentation on their team’s prospects for the 2013-2014 winter sports season. The annual coach’s pre-season poll was conducted for each sport during these meeting. The 2013 TRAC girls gymnastics All-Academic award winners have been announced. The 2013 TRAC All-Conference teams for girls gymnastics have been announced. Alexa Settlemire of Findlay was named the TRAC Gymnast of the Year for the second consecutive year. St. Ursula Academy head coach Mike McKee and Clay head coach Nick Distel were selected as co-recipients of the Coach of the Year award. Findlay senior Alexa Settlemire won all four events and the all-around title as she led the Lady Trojans to the 2013 Three Rivers Athletic Conference gymnastics team championship on February 9 at the Exceleration Gymnastics Center in Toledo, Ohio. Findlay dominated the scoring racking up 141.90 points and bettering runner-up Notre Dame Academy, which scored 130.95 teams points , by 11 points. Clay, which captured the inauguaral TRAC gymnastics championship last year, finished third with 128.45 points, followed by St. Ursula Academy (119.55 points), Whitmer (106.36 points), and Central Catholic (94.20 points). Fremont Ross and Lima Senior do participate in gymnastics. 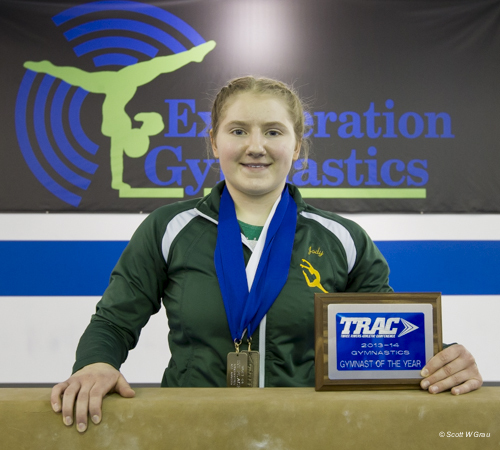 Settlemire was named the TRAC Gymnast of the Year for the second consecutive year. Mike McKee of Notre Dame Academy and Clay’s Nick Distel were selected as co-recipients of the TRAC Coach of the Year award.